If you are fig obsessed, like me, this snack is definitely for you! I wait all year to binge on fresh, plump and juicy figs. Until then I satisfy my cravings with dried figs. I decided I wanted to try making my own fruit and nut energy bites so the obvious ingredient choice was dried figs. I’m happy to report that these Fig & Walnut Energy Bites turned out Awesome on the first try (that almost never happens)! These unassuming little bites at packed with nutritious ingredients, simple to make, a great snack on the go . . . And, they taste similar to the filling inside a Fig Newton! Yeah, you read that right. Fig Newton filling without the dry, flavorless cookie exterior. If you remember from my Brown Rice Pudding post, I am not a morning person. So, not only are these a great snack they are the perfect breakfast for me. 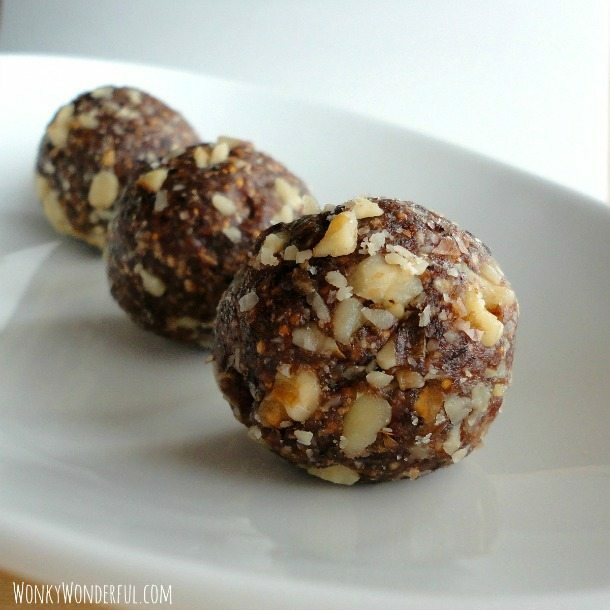 Fig & Walnut Energy Bites are a great healthy snack. Easy to make and very tasty! In a food processor, blend the oats into a powder. Add the dates (always double check that the pits have all been removed from the dates). Blend until the dates are a thick paste. Remove stems from the dried figs and blend into the mixture. Now add the honey and coconut oil. Pulse until all ingredients are combined into an extremely thick paste. Place mixture into the refrigerator to cool and set. Process the walnuts to your desired size. 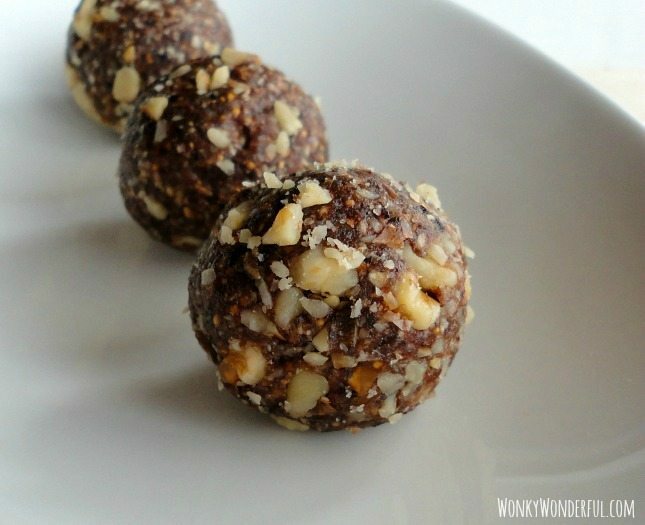 Remove the fig mixture from the refrigerator and begin rolling into bite sized balls. Roll each ball into the chopped walnuts and place into a sealed container. I also stuffed walnuts into the middle of each energy bite. Store in the refrigerator for up to two weeks. 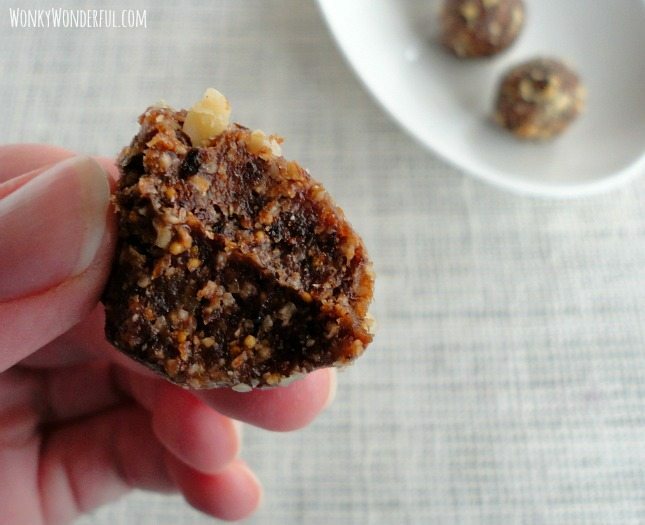 This recipe makes approximately 16 Fig & Walnut Energy Bites (depending on size). Take a bite! So tasty. Now I got figs on the brain, I can’t wait for summertime! Feel free to leave a question/comment or email me directly at wonkywonderful@gmail.com. I love figs. What a great workout snack!!! Your site looks beautiful! Can’t wait to see more! Love energy bites! They are perfect for snacks and on the go breakfasts! Can’t wait to try these! Yes, these are terrific for a quick snack. Thanks for the visit! I love the combination of figs and walnuts. I can’t wait to try this! These look so delicious! And healthy, too! Hi Audra, these are super delicious and full of nutrition! Love them. Thanks for stopping by! These fig bites look marvelous, Nicole. I haven’t had a fig in ages (but I simply lived on them as a kid). Time to revisit them for sure. Thanks for the recipe! Do you think these Fig Bites would freeze well? I have a food saver and I was thinking about trying it and was wondering if you had. I have not frozen these before (I don’t usually have any leftover!). I imagine they would freeze okay though. I am getting 15-20 fresh Chicago Hardy figs/day and have made all the jam I want for myself and friends. I love these energy bite ideas, but I have frozen them. That brings out much of the juice so I doubt the frozen ones would work in this. I am wondering about fresh ones?